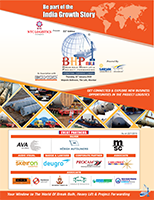 Congratulations for the success of BHP-MALA 2019. This success is more important as Break Bulk, Heavy Lift and Projects is complex topic. I understand that it was a successful conference linked with good networking opportunities and great panel discussions. I thank the entire EXIM team for your gracious welcome, kind hospitality and compliment you on very successful BHP-Mala 2019!! Mr. Ashok Vaid, Managing Director, Lexicon Overseas Pvt. Ltd.
Congratulations for arranging a great event. Kudos to you and your great team. Capt. Atuldutt Sharma, Breakbulk Sales Manager, Höegh Autoliners (India) Pvt. Ltd. Thanks for the fantastic event which was very useful for the Shipping Industry and had great participation from across the various stakeholders in the supply chain from Shippers, LSPs and Carriers. Mr. Christopher Phillips, Director - Chartering - Bulk / Projects / Steel, Seatech Shipping & Project (I) Pvt. Ltd. The event was well organised and professionally presented and all our best wishes to EXIM and it was a successful event and most important getting all professionals in the particular vertical of heavy lift segment of the Shipping Industry together on the given day. All our best wishes with EXIM and your professional TEAM and all the best for your future events in the year. The function witnessed all respected personalities related to logistics, its was awesome gathering & feel privilege having interacted with these august gathering. We could bring forward the both sides (expectations & gaps) of industry requirement and created awareness for future path. The arrangement was excellent. My Big thanks to you & your EXIM INDIA team.